Group photo (Summer 2015, in front of Riverbend Research South). 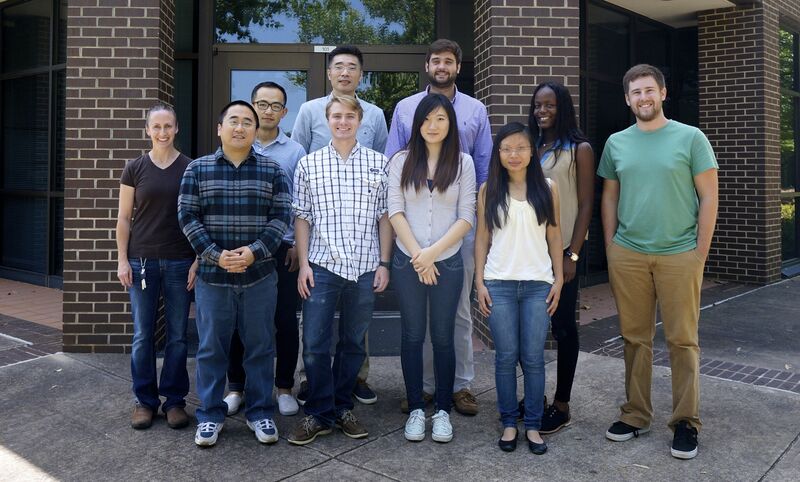 From left to right: Becky Bundy, Rui Cheng, Wujun Zhao, Leidong Mao, Joshua Miller, Matt Amrit, So Hyun Lim, Zhaojie Deng, Nneoma, Okonkwo, Sam Arsenault. Leidong Mao, Ph. D., is an Associate Professor in the College of Engineering at the University of Georgia in Athens, GA. Professor Mao received the B.S. degree in Materials Science at Fudan University, Shanghai, China, in 2001. 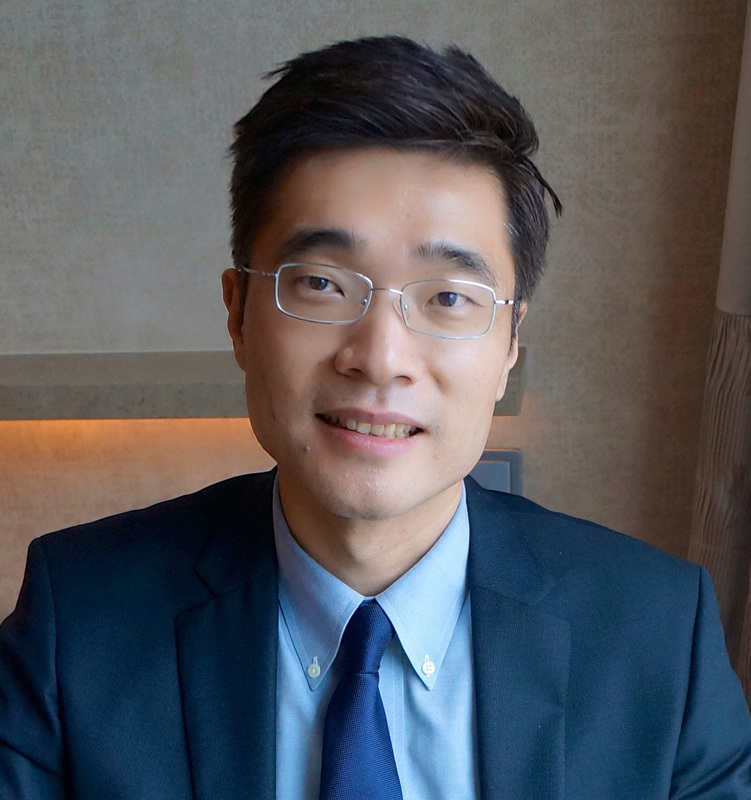 He received the Master of Science degree, Master of Philosophy degree and Doctor of Philosophy degree in electrical engineering from Yale University, New Haven, CT, in 2002, 2005 and 2007, respectively (advisor: Prof. Hur Koser). He joined the faculty of Engineering at UGA in 2008 and was promoted to Associate Professor in 2013. His current research interests include nanoscale magnetism and its application in biomedical applications such as cell sorting, single cell study, droplet microfluidics, hyperthermia, and magnetic nanomanipulations. Projects in his lab involve nanoparticle synthesis, device fabrication and testing, and physical modeling. He received the NSF Career Award in 2012, and a Young Scientist Award from 13th International Conference of Magnetic Fluids in 2013. 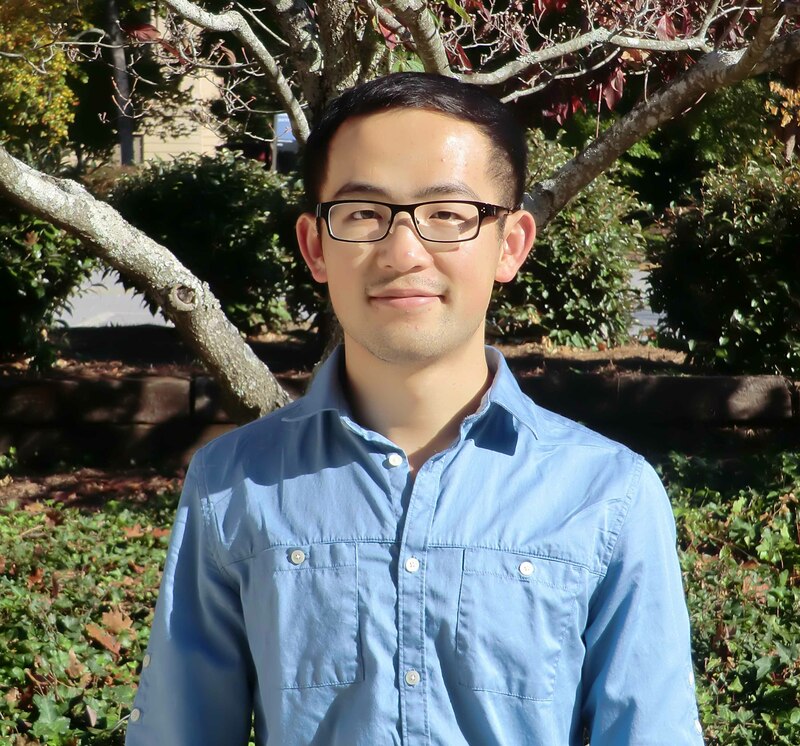 Rui Cheng is a postdoctoral associate at the University of Georgia and a research associate in Dr. Mao’s lab. Rui Cheng received his B.S. degree from Tsinghua University. He received his Master degree from University of Minnesota. He received his PhD degree from UGA in 2016. Zhaojie Deng is a graduate student at the University of Georgia and a research assistant in Dr. Leidong Mao’s lab (from August 2012). Zhaojie Deng received her B.S. and Master’s degree in Electronic Science and Technology at Huazhong University of Science and Technology, Wuhan, China in 2008 and 2011 respectively. Wujun Zhao is a graduate student at the University of Georgia and a research assistant in Dr. Leidong Mao’s lab (from August 2013). Wujun Zhao received her B.S. degree in Chemical Engineering and Technology at Jilin University, Changchun, China in 2013. 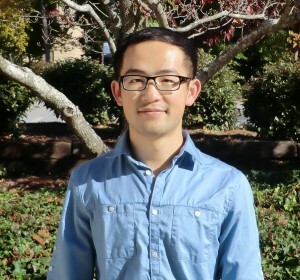 Yang Liu is a Graduate student at the University of Georgia and a research assistant in Dr. Leidong Mao’s lab (from August 2016). Yang received his B.S. degree in Chemistry at Purdue University in 2014. 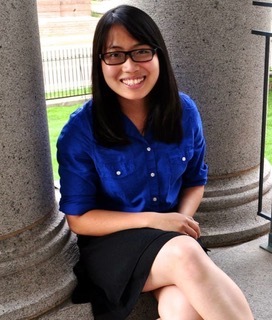 Jia Hwei Cheong is a graduate student at the University of Georgia and a research assistant in Dr. LeiDong Mao’s lab (from August 2016). Jia Hwei received her B.S. degree in Chemistry from University of Minnesota in 2014. 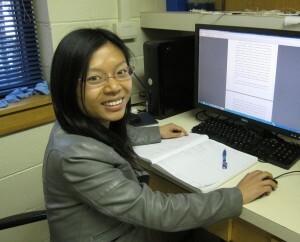 Li Tian, Ph.D., was a visiting scholar in Dr. Mao’s lab at the University of Georgia (from April 2011). Li Tian received her Ph.D. (2009), and M.S. (2002) in Microelectronical Engineering in Harbin Institute of Technology, China. She received the Bachelor of Science in Precision Instrument in Harbin Institute of Technology, China in 1995. Beforing coming to US, she is an associate professor in School of Astronautics at Harbin Institute of Technology, China. Becky Bundy, Ph.D., has been teaching AP Physics, Physics and Chemistry for 8 years, the last 7 of which have been at Madison County High School in Danielsville, GA. Becky has a PhD in Microbiology (2001) from the University of Georgia, and was a post-doctoral associate there for 5 years (in Molecular Parasitology) before becoming a high school science teacher. She is an active member of the Georgia Science Teachers Association, presenting new and exciting ideas to other science teachers as often as possible, and loves nothing more than bringing cutting edge research into her classroom to help foster her student’s love of science. In 2016, Dr. Bundy started her new job at Standford Underground Research Facility as a science education specialist. 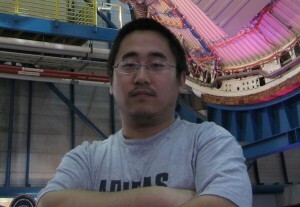 Taotao Zhu, Ph.D., was a graduate student at the University of Georgia and a research assistant in Dr. Mao’s lab (from April 2009). Taotao Zhu received his B.S. degree in Forestry at Nanjing Forestry University, Nanjing, China in 2006. He received the Master of Science degree in Botany from Nanjing University, Nanjing, China in 2009. He graduated from Dr. Mao’s lab in December 2013 and held a position in Procter & Gamble in Cincinnati, Ohio. Matthew Amrit, M.S., was a graduate student at the University of Georgia and a research assistant co-supervised by Dr. Leidong Mao and Dr. Ramana Pidaparti (May 2014-2016). Matthew received his B.S. degree in Physics from Louisiana State University in 2013. Sam Arsenault was an undergraduate student at the University of Georgia and a research assistant in Dr. Mao’s lab. He is currently a graduate student in Integrated Life Science program at UGA. Sam is from Marietta, Georgia and graduated from Wheeler High School in 2011. Joshua Miller is an undergraduate student at the University of Georgia studying chemistry and is currently a research assistant in Dr. Mao’s lab. He is from Acworth, Georgia and plans to graduate from the University of Georgia in 2017. So Hyun Lim is an undergraduate student at the University of Georgia and a research assistant in Dr. Mao’s lab. She is a Pre-Dental student majoring in Microbiology. She graduated from Collins Hill High School in 2013. Emily Tanasse is an undergraduate student at Boise State University studying mechanical and biomedical engineering. She was a research assistant in both Dr. Mao’s and Dr. Karumbaiah’s labs for the summer of 2015, and returned to Boise State in the fall to start her junior year. She is originally from Seattle, WA and graduated from kentlake high school. Nneoma Okonkwo is an undergraduate student at the Massachusetts Institute of Technology. She is a Biological engineering major and French minor. She comes from Lagos, Nigeria and graduated from Kent School, CT in 2014 and plan to graduate from MIT in 2018. Courtney Jones is an undergraduate student at the Syracuse University. She was a REU student in Dr. Mao’s lab in summer 2016. Bryana Harris is an undergraduate student at the Auburn University. She was a REU student in Dr. Mao’s lab in summer 2017. Francisco Marrero was an undergraduate student at the University of Georgia and an research assistant in Dr. Mao’s lab (from Sep 2008). 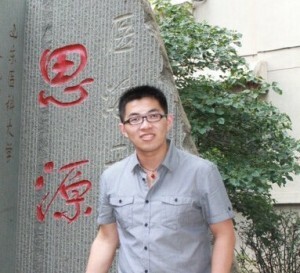 He is a part of the UGA CURO apprentice program, and works with Dr. Mao through this program. Currently his majors are Chemistry and Economics. Francisco is from Columbus, Georgia and graduated from Columbus High School Preparatory Magnet. Rohan Mukhopadhyay was an undergraduate student at the University of Georgia and a research assistant in Dr. Mao’s lab (from Dec 2008). He is part of the Foundation Fellows program and is studying Biochemistry and International Affairs. Rohan is from Marietta, Georgia and graduated from Lassiter High School in 2008. Grant Stearns was a senior at North Oconee High School and volunteers research time throughout the summer in Dr. Mao’s lab (from June 2009). He plans to do further research and to major in an undecided field of engineering. Andy Kim was a student at Athens Academy High School and volunteers research time throughout the summer in Dr. Mao’s lab (from June 2010). He finished a project on non-magnetic particle assembly in ferrofluids. Sameer Mishra was a senior at Wheeler High School and works in Dr. Mao’s lab as a research assistant during the summer (from May 2011). He plans to pursue a career in research and to major in Biological Sciences. Alex Noakes was a senior at North Oconee High School and a dual-enrolled student at UGA. He is volunteering research time in Dr. Mao’s lab during the school year (Fall 2011). He plans to major in Biomedical Engineering in college. Pranav Bhandarkar was a senior at North Oconee High School and is a dual-enrolled student at UGA. He volunteers research time throughout the year in Dr. Mao’s lab (since June 2013). He is currently working on a project that models nanomaterial interaction with cellular membranes. Woo Jae Kim was a junior at Northview High School and volunteers research time throughout the summer in Dr. Mao’s lab (from June 2014). He finished a project on algal cell harvesting using magnetic nanoparticles. He plans to pursue career in research and major in field of engineering.